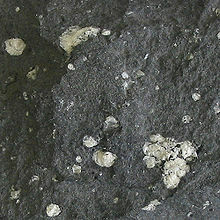 A sample of andesite (dark groundmass) with amygdaloidal vesicles filled with zeolite. Diameter of view is 8 cm. 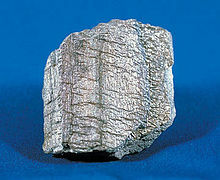 Dunite – An ultramafic and ultrabasic rock from Earth's mantle and made of the mineral olivine. 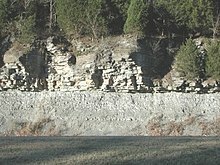 Harzburgite – An ultramafic and ultrabasic mantle rock. Found in ophiolites. 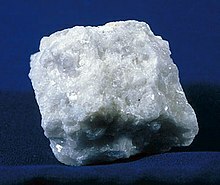 The following are terms for rocks that are not petrographically or genetically distinct but are defined according to various other criteria; most are specific classes of other rocks, or altered versions of existing rocks. Some archaic and vernacular terms for rocks are also included. List of rock formations – Links to Wikipedia articles about notable rock outcrops: for a list of unusual or culturally significant rock outcrops.